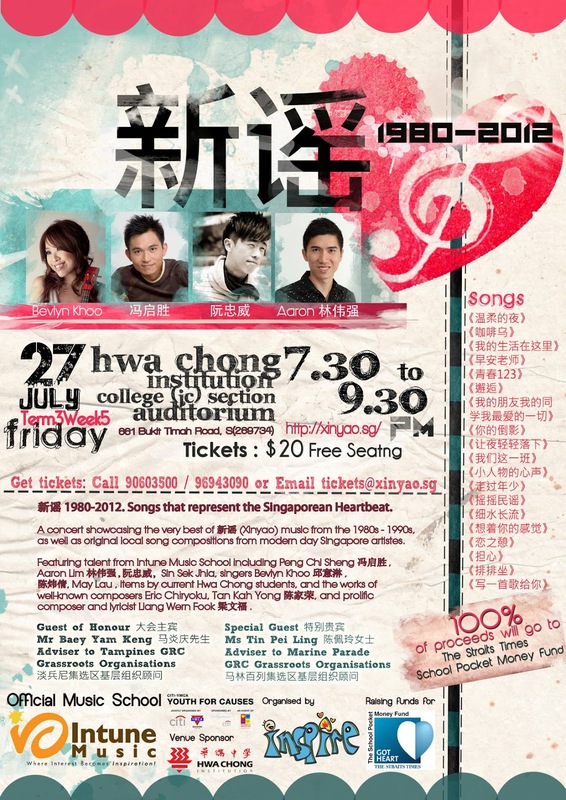 Just a plug for a charity concert that my friend Peng Chi Sheng (second from left) will be performing at. He runs Intune Music School with partner Aaron, and they provide vocal and music classes for kids and adults alike (check out their Youtube channel for some of their performances). What: A concert showcasing the very best of 新谣 (Xinyao) music from the 1980s - 1990s. If you grew up in the 80s and 90s, you'll remember what Xinyao was. Maybe you'll recognise some of the songs listed on the poster (click image to see bigger version). Some are from Chinese TV serials and many are by composer Dr Liang Wern Fook, who is a proliﬁc composer and lyricist, having created over 100 songs in over 30 years. They'll be performed by artistes from Intune Music School and Hwa Chong Institution. Also available at the door starting 5:30pm on the day itself. I may have some extra tickets too, so email me if you are really keen. Come and listen to some nostalgic tunes and that cheer will do good too - 100% of the proceeds will go to the ST Pocket Money Fund. Say hello as well to Guest of Honour Baey Yam Keng and Special guest Tin Pei Ling!